Diary of a Miner: Day 51: Mystery, adventure and intrigue back on track! Day 51: Mystery, adventure and intrigue back on track! I couldn't have predicted what happened today, even if I had a million guesses! It seemed so bizarre, and slightly worrying. I am actually worried about who or what is watching me! From what I found today, they know more about me than I gave them credit... They've got my entire life "mapped" out! Today started a little like yesterday; I didn't really want to get up, but a small part of me was able to force me out of bed and downstairs. I still didn't feel like returning to normality, and the prospect of going back into the open-cast mine scared me a little... I was also still rather reluctant to do any mining because of the message I received from HoN Co. yesterday! They had sent me a message, which summed up, pretty much told me "you're a liar, and we don't believe you"! I honestly didn't know what I had to do for them to take notice of the strange goings-on that had happened recently! 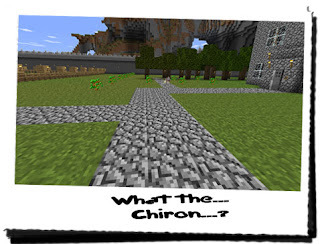 The disappearance of the ship's crew was surely mysterious enough for them to take notice, but then the zombies, Creepers, mines, dig sites, portals and this "THEROS"... The evidence was stacking up, but apparently not in my favour. Trying to put my mind onto a more pleasant train of thought, I decided what would occupy my day. I might get back into mining tomorrow, maybe level out the top of the open-cast mine, but for now, I was going to do something relaxing. As I looked out of the window, I could see the farm; I was rather proud of that little plot of land. The only problem was that animals would often find their way through the gates and wander onto the plot. Then they'd either eat the crops, or trample it back into the ground! I sat there and thought; is a greenhouse a viable option? Well, it was something to do, and so I got to work. I went to the mine, put a load of excavated sand and put it into carts and sent it along to the forge. Some glass panes were in order! I spent a good hour crafting hundreds of panes of glass to make the greenhouse, but I would first need a framework. This would easily be created using long sticks made from wood. 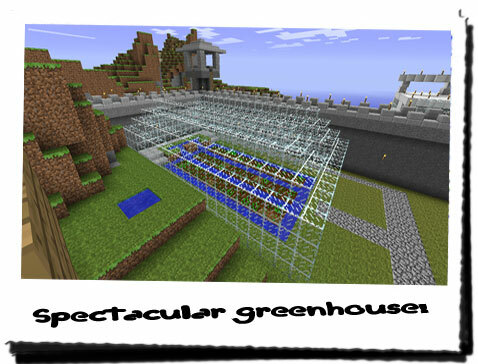 This would provide support and act as a guide to ensure that the greenhouse was built perfectly. I took the glass panes from the forge to the outside of the farm in shuttle runs, and the came back for the wooden sticks. I had the basic framework finished in a matter of minutes, and then I began to fix the glass panes into place. As I placed the lowest layer of glass panes into place, I began to think about the water source, and thought it would be more feasible to have a way to access it. I removed the fences surrounding it, and added small stone steps leading up to it, around the back and down the other side. I then continued the base layer of glass panes, back round to the entrance, leaving enough space for the doors. After an hour, I had made impressive progress; the majority of the walls had been constructed, and it was simply a matter of finishing off the roof. I had already decided, awhile ago, that the roof would be the traditional two-peak roof for the greenhouse. I don't know why, but it always seemed to look good, and I had the glass panes to build it! Another hour later and I had finished the greenhouse! It had taken up until midday, but it looked spectacular, and once again it possessed a rather handy purpose. The glass walls and ceiling not only provided the plants with protection from wandering animals, but also allowed light in throughout the day. The door provided access and security. I was tempted to put a small wooden storage shed round the back to store the farming tools and the reeds, wheat and seeds, but that could be done at a later date. I had just thought of something else to do! With the greenhouse finished, I took the tools and remaining glass panes back to the house. Before I left, I took the saplings I had kept in a chest, along with a few bones. I was going to replant the entire forest that burnt down when I was back on the island. I was just hoping that it didn't happen again. I went down to the small area near the forge and began to plant the saplings. I planted them a reasonable distance from each other, the path and the forge, and then I added the bones to them. Just like magic, the bones began to dissolve and the sapling grew, in front of my eyes, into a fully grown tree! I loved watching them grow; it reminded me of those nature programs where they would take a camera and film a flower growing over the course of a week! It was brilliant, except now it was for real! 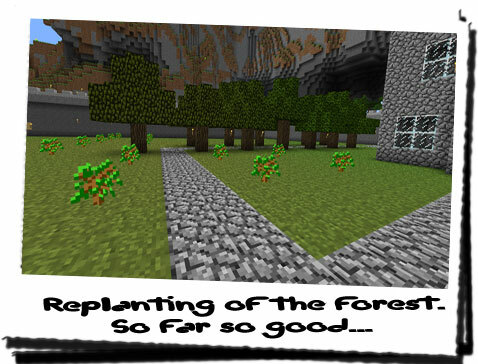 I affixed a few torches to the trees and then stopped... The torches... I had placed torches onto the trees last time... Had that been the cause of the fire? All this time I had blamed some strange figure for destroying my wood supply, when it was more than likely me being careless! I removed the torch, and placed it onto the bark of the tree, but lower down where the flames could not lick at the leaves. I wasn't going to have a repeat of that! 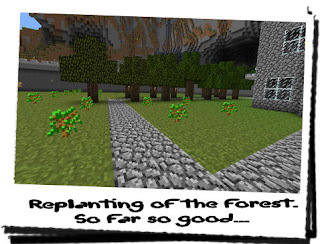 After while, I had planted and grown quite a few trees, but I had ran out of bones. I went back to the house to get some more. By the end of the afternoon, I was going to have a brand new forest! As I walked back to the forest, I began to think about collecting more bones. I was running low, and we could always use the meat from the animals as well! As I got the stairs leading down to the forge, I stopped. Up ahead, on the path near the new trees was a wolf. 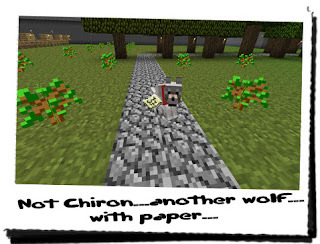 It was wearing a red collar and looked a lot like Chiron. Was it Chiron? Had he ran past me and decided to wait for me back at the forge? As I got closer, I noticed small differences and began to think it wasn't Chiron. Also, I noticed that it wa sitting next to something lying on the ground... a bit of paper... As I neared, it looked at me, and then towards the paper. When I was a few feet away it looked back at me, and then barked a few times. It wasn't aggressive and it didn't attempt to attack me. It stood up, barked once more and then ran off towards the beach at the front end of the wall. 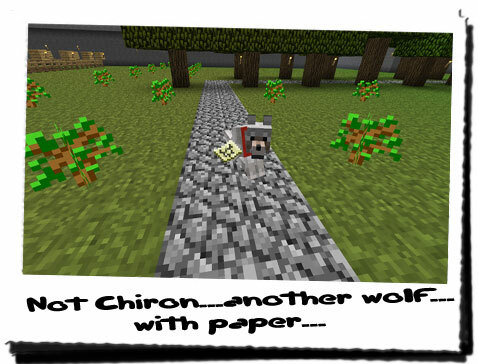 I looked at the direction the wolf had gone to, and stood there confused... what was going on? Was that dog actually wearing a collar? I then turned my attention back towards the paper on the ground. Stooping down, I picked it up and realised it was actually two pieces of paper, clipped together! On the front piece of paper was a simple not with the words "Seek out the second portal" with the name "THEROS" scrawled at the bottom. It was from THEROS! The same person/people/thing that had put me on the right track to destroy the first two portals! I tore off the note and looked at the second piece of paper underneath. What I saw I couldn't believe! It was literally impossible! It was a map! A map of the surrounding area! 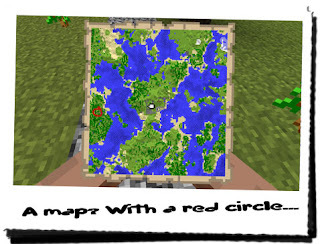 On the far left-hand side was a small red circle, drawn on separately, indicating a location. Was the note referring to the circle? It must be! That must be where the next portal was! I looked back at the note... And then back to the map. I quickly found my reference point! My small walled area was cleared marked in the centre of the map! It was hard to miss! Someone had put in so much detail that they had even shown the farm on the inside of wall, including the forge and house! Someone had got close enough to inspect the area! And I hadn't noticed them! According to this map, the area I was located was the largest landmass, with a series of smaller islands dotted around. After a while of looking at it, I located the small island I had found the camp site on, but it didn't seem right. The map hadn't been drawn as conventional maps are drawn. It was drawn with the top of the map indicating East! This at least correlated with the rest of the area I knew, as the dig site was indeed on an island to the South of my wall! I stood there for a long time, in awe of the detail of this map! Someone had spent a lot of time on this, and spent a lot of time exploring! They really wanted me to destroy these portals! I'm back at the house now, and it's starting to get dark. I've been looking at the map for ages, a whole new series of questions popping into my head. The most obvious one had already occurred to me awhile ago: if this THEROS knew where they were, why didn't they destroy them? Why contact me? Why did I have to be involved? Those questions slowly lead to "who is THEROS?" and to further questions such as "is THEROS a group?" and "why not contact me directly?". It had taken some time, but I had taken it all in, and I had decided that this was a good opportunity to explore the area around me. It might even lead to where THEROS might be hiding, although if I hadn't seen them yet, it was unlikely. 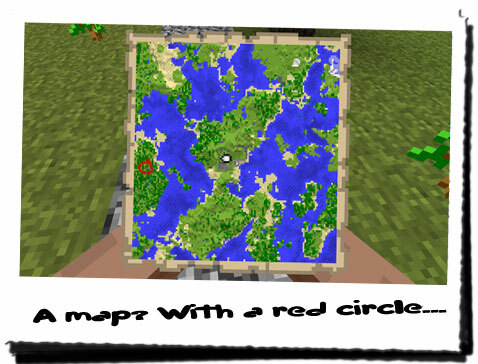 From the map, I would need to travel by boat, to the island, where the red circle was. But there was no way of getting the boat down on the pier all the way around to the island without taking it over land! It was pointless making a new boat, but it meant I would have to haul it from the beach, past the wall to a small bay on the opposite side. In fact, according to the map, at the North-Western most corner of the wall was a small bay where a dock or pier would be perfect! I would have to get ready and set out relatively early to reach the island, find the portal, destroy it and return before nightfall!